FREE Bottle of Jiffy Cleaner with Jiffy Steamer Uprights Use Jiffy chemical free steam to freshen (remove odors) and remove wrinkles from Fabrics, Clothing, Garments Drapery, Carpet, Upholstery, Auto Interiors, Wigs, Hats, Floral (even opens rosebuds when they are ready). 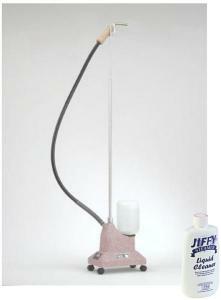 Jiffy steamer uses 35-40% warm moist water required to help relax fibers and remove wrinkles. Also helps removes wallpaper and window tint. Only 2 minute heat up on most models. 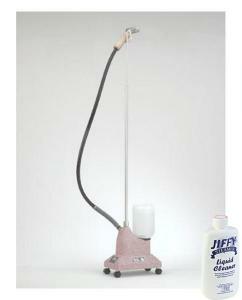 As the world's oldest and largest manufacturer of garment steamers and steamer equipment for personal and professional use, Jiffy Steamer manufactures over 16 fabric steamers and clothes steamer models including the popular Esteam® in the USA, with only the finest industrial and professional components available (98.5%US). Jiffy Steamer customers throughout the world enjoy the ease of use when steaming clothes or fabric in their home or business, simplicity of the process, and the omission of the ironing board. 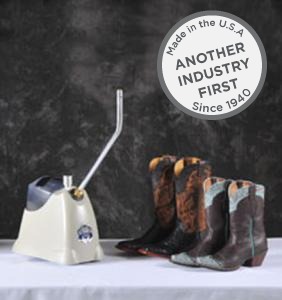 Jiffy Steamer is the only manufacturer of garment steamers in the USA. All other brands are made in China. 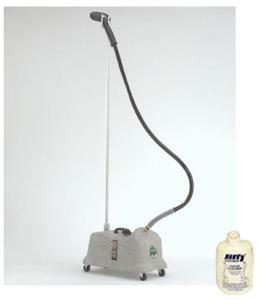 The Jiffy Steamer is intended to be used upright so the steam can rise out of the hose. The jiffy steamer, if used horizontally will spit water out. 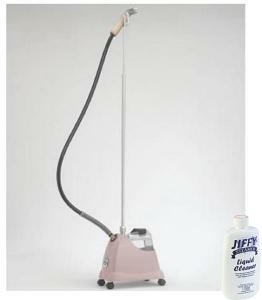 The Jiffy steamer also provides a continuous soft flow of steam, when being used correctly. 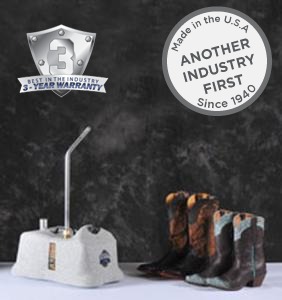 Jiffy Steamer’s innovative steaming products and solutions, coupled with unmatched customer service, makes the company the industry leader in steam technology. Prices are subject to change, and only current prices will be honored. "This model produces a good amount of continuous steam from its generously sized water tank, yet is lighter than other brands with similar capacities. 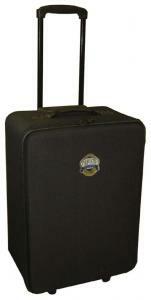 Its slim shape also makes it easy to tuck into a suitcase, though no attachments are included for its hefty price tag." 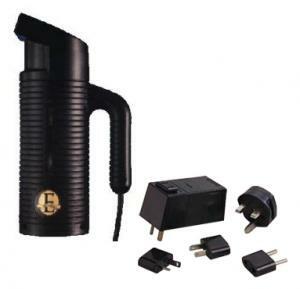 Jiffy Steamer's Esteam is the most powerful hand-held steamer on the market. Made of the finest materials available, many years of research and testing were spent developing the ESTEAM. This simple-to-operate steamer is ideal for use at home, in the office and on the road. The ESTEAM is also a perfect gift for college students and newlyweds. 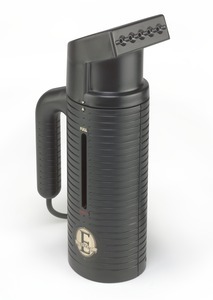 The ESTEAM incorporates many of the same components used in Jiffy's commercial grade steamers making it the finest hand-held steamer on the market. 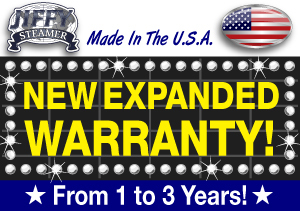 Non-US Warranty: 30 days parts and labor. 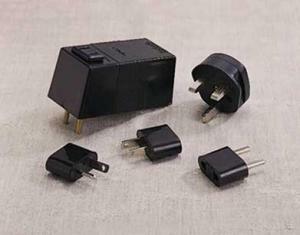 The Esteam converter adapter system only converts 230V voltage power source to 120V voltage for Esteam. It does not work with any of Jiffy Steamers 230V upright steamers. The #1 best handheld portable fabric steamer for travel, clothing, garments, bridal, drapery, linens, embroidery, upholstery, ready to wear & retail. 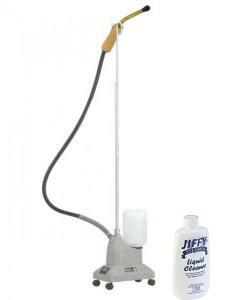 The Jiffy Model J-2 garment steamer is recommended for home or light commercial usage with 1300 watts of steaming power. 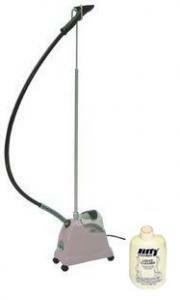 The J-2 offers the power to remove wrinkles quickly and effectively, reducing the need to iron. Steam is so gentle that you can apply it to most fabrics without fear of scorching. The base of the steamer unit is solid die cast aluminum that offers durability. Provides steam in less than 2 minutes and will continue to steam for 2 hours per filling. Replacement bottle and cap for J-2 Jiffy® Steamers which use the check valve system. This part is used for J-2 steamers with serial numbers of T220281 and higher. 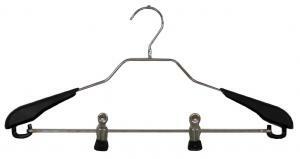 Note: Hanger Hook Included, but not the hanger shown in picture which shows how it is used. 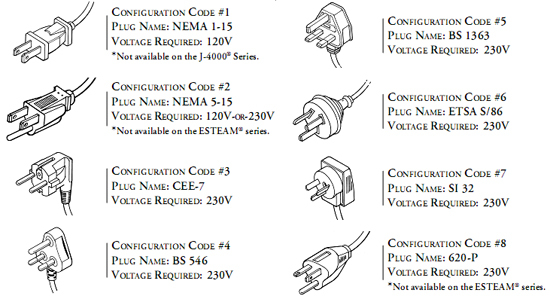 See Optional hanger sets under Recommended Accessories below. Vertical ironing board for hanging trousers and other garments - mountable on any wall or door with bracket included. USA/Canada Only due to 42 Lb dimensional weight 6x26x51"
The Jiffy Steamer Steamboard is equipped with an eye screw that holds Jiffy’s professional garment hanger at the top of the steamboard. 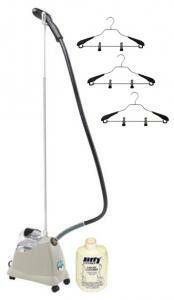 This sturdy hanger holds the clothing in place and provides a convenient workplace to steam. The board is covered with moisture-resistant fabric and attaches in 1 of 2 ways: 1) Directly to the wall with screws, 2) Hangs over a door with a bracket. Attachment options are included in the steamboard carton. Only UPS ground shipping available for this product. Not for export. Please note that the actual weight is 33 pounds, but because the shipping box is oversized at 51x6x26", UPS charges us for 70 pounds in the Oversize 2 category. We charge the same 70 pounds to you, not 33 pounds. Replacement bottle and cap for J-2 Jiffy Steamers with Serial Numbers starting with "C" and Serial Numbers of T220280 and lower. The Jiffy Steamer Model J-2B is our specialty steamer used worldwide in homes and by cleaning services, service-oriented businesses, commerical estabishments, and rental outlets. 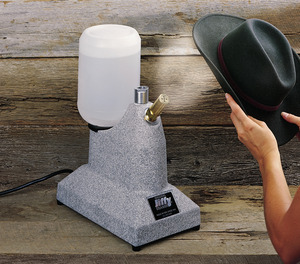 The J-2B, outfitted with Jiffy Steamer's new specialty brush steam head attachment, is used as a cleaning tool for tough, ground-in dirt and stains. Chemicals and sprays are not necessary to get the tough jobs done. The steam alone kills bacteria on contact. 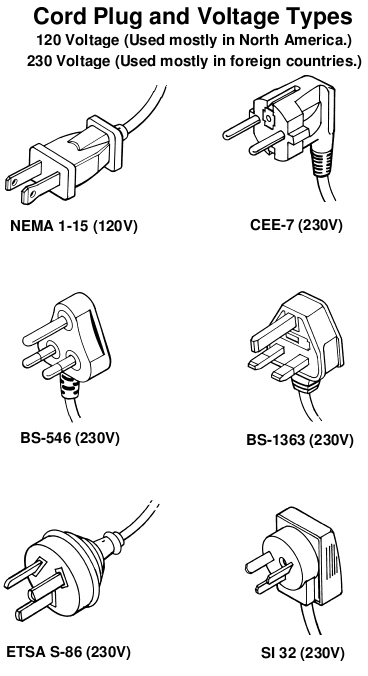 Scrubbing power is supplied by the stiff-bristled end to direct the tight pattern of steam to the desired surface. The Jiffy Steamer Model J-2B is our specialty steamer used worldwide in homes and by cleaning services, service-oriented businesses, commercial establishments, and rental outlets. The J-2B, outfitted with Jiffy Steamer's new specialty brush steam head attachment, is used as a cleaning tool for tough, ground-in dirt and stains. Chemicals and sprays are not necessary to get the tough jobs done. The steam alone kills bacteria on contact. Scrubbing power is supplied by the stiff-bristled end to direct the tight pattern of steam to the desired surface. The Jiffy® J-2000 garment steamer provides the most gentle, safest and most efficient method to remove wrinkles from fabrics. The powerful action of steam penetrates the fibers, relaxes them and causes the wrinkles to release. Unlike ironing, the gentle method of steaming increases the life of clothing. Steaming breathes new life into fabrics; conversely, ironing crushes clothing fibers. Not to mention many people find that steaming is up to five times faster than conventional ironing. Availability: Usually leaves the warehouse on the next business day. Fusible link with automatic shut-off for safety. Hangers won't get rusty and ruin your clothes. As your dry cleaner knows, steam is the gentlest, safest, most efficient method to remove wrinkles from fabrics. 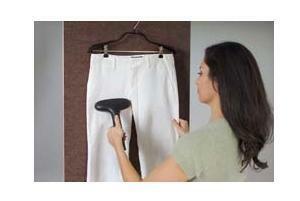 The powerful action of garment steamers penetrate the fibers, relaxes them and causes the wrinkles to release. Unlike ironing, the gentle method of steaming increases the life of clothing. 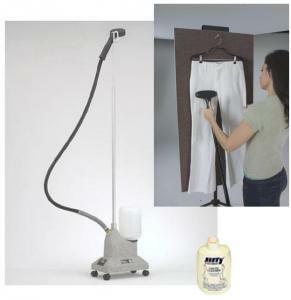 Garment steamers breathe new life into fabrics; conversely, ironing crushes clothing fibers. 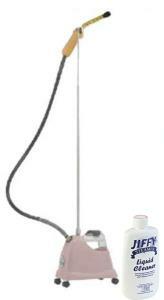 Many garment steamer users have found that steaming is up to five times faster than conventional ironing. 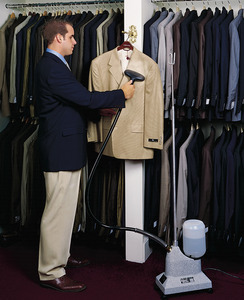 The Model J-2000 garment steamers have the same lightweight, flexible hose and easy-roll casters for mobility as the Model J-2 garment steamer, but with an updated design and several ergonomics features. 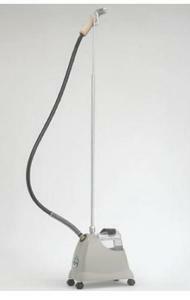 This versatile Residential Series garment steamer has even been found by some owners to eliminate dust mites in bedding. You will enjoy discovering new applications for this powerful and flexible appliance in your home. The standard Model J-2000M Residential garment steamer is recommended for home or light commercial usage with 1300 watts of steaming power. The J-2000M is equipped with a clear, plastic 3/4 gallon water reservoir with a no-drip check valve system, a 5 ½ foot flexible hose and easy roll casters for mobility. The hose attachment has a metal steam head with a wood handle at the end of the hose. This type of hose attachment is more durable, but does get hot around the metal and tends to be heavier than the plastic steam head and handle combination. The J-2000M is equipped with an on/off switch and heats up in 1 minute. 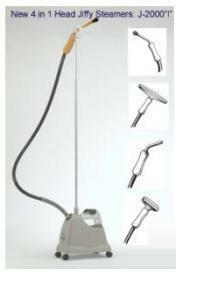 Jiffy metal steam heads J2000M are aluminum with a wooden handle for durability. The J2000 Norel plastic steam heads and handles are cooler to the touch than metal and wood. # Carton size: 17.5" x 12" x 15"
Carton size: 17.5" x 12" x 15"
*Can leave on preheat setting all day and use intermittently in minutes without going through the entire heat cycle each time you use it. You can leave on preheat setting all day and use intermittently in minutes without going through the entire heat cycle each time you use it. The J-4000 Pro-Line Series is Jiffy Steamer's most powerful model designed for commercial purposes. Known as a durable "workhorse" in the industrial fabric and garment trades, the Model J-4000 is an essential tool in a multitude of applications ranging from removing wrinkles to retouching drapery to installing carpet. Coupled with the several available hose attachments, the J-4000 Pro-Line Series Jiffy Steamer is a welcomed presence in any industry. 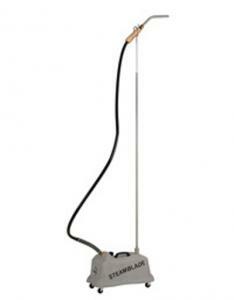 J4000A 7.5' Hose, Wooden Handle, 6" Aluminum Steam Head, 9" Straight Upholstery Metal Pipe Steam Head to help clean, freshen & remove wrinkles from upholstery fabric & carpet. Preheat time approximately 15 minutes (has to heat the entire 1 gallon of water)then produces steam within 2 minutes, once at preheat temperature. 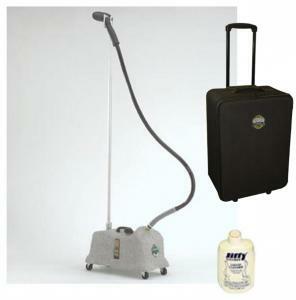 The heavy duty Model J-4000A auto upholstery steamer is equipped with 1500 watts of steaming power. The J-4000A is equipped with a 1 gallon self-contained water tank with preheat and steam settings and a 7 ½ foot hose attachment with dual interchangeable metal steam heads for the hose. Interchangeable heads include a 6 inch aluminum steam head and a straight pipe steam head for hard to reach places while working with auto upholstery. It contains a sight gauge on the side of the steamer to view water level and sediment build-up at a glance. The J-4000A heats up within 15 minutes to preheat temperature and produces steam within 2 minutes once at the preheat temperature. 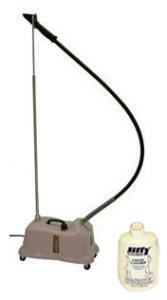 Jiffy J4000C Carpet steamers are designed for carpet installers, as it relaxes the backings and allows for easier installation. It also restores carpets when moving furniture. *Free $10 Essential Jiffy 0898 Liquid Cleaner Solution. Remove Scale & Hard Water Deposits from Steam Boiler Tank, 10oz Bottle FREE with most Uprights. Ship Ground in USA Only. *7.5' Drapery Hose is not for garments which use 5.5' Hoses. The longer drapery hose is not as efficient in steam production required for taking wrinkles out of garments. The heavy duty Model J-4000”I” Commercial all-purpose steamer is equipped with 1500 watts of steaming power. The J-4000”I” is equipped with a 5.5 foot flexible hose attachment and 4 interchangeable steam heads consisting of a 9” bent aluminum pipe head attachment, “B” brush steam cleaning head, 6” wide metal steam head and a 12” wide carpet steam head. 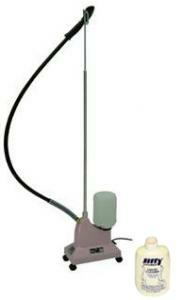 This model has a 1 gallon self-contained water tank with preheat and steam settings. It contains a sight gauge on the side of the steamer to view water level and sediment build-up at a glance. The J-4000”I” heats up within 15 minutes to preheat temperature and produces steam within 2 minutes once at the preheat temperature. 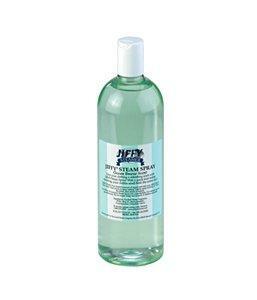 *Free $10 Essential Jiffy 0898 Liquid Cleaner Solution. Remove Scale and Hard Water Deposits from Steam Boiler Tank, 10oz Bottle FREE with selected Upright Steamers. Ships Ground Only in USA 48 States. Includes “B” 1" brush steam cleaning head, 6" metal 6 hole steam head, 9” bent aluminum pipe head attachment for hard to reach areas, and a 12” wide carpet unrolling steam head with 11 holes..
Jiffy® Steamer would like to introduce another industry first...the SteamBlade. The SteamBlade is an innovative product designed to simplify the removal of window film, vinyl wrap and lettering.With the swipe of the SteamBlade, the warm, moist steam quickly and safely unbinds the glue from the window, simplifying this once tedious task. The SteamBlade will allow you to remove window film, vinyl wrap or lettering in a fraction of the time of conventional methods. Put down the razor and reach for the Steam. Quickly remove window film, vinyl wrap and lettering without chemicals, razor blades or the frustration commonly associated with this tedious task! Jiffy® Steamer would like to introduce another industry first... the SteamBlade. The SteamBlade is an innovative product designed to simplify the removal of window film, vinyl wrap and lettering. With the swipe of the SteamBlade, the warm, moist steam quickly and safely unbinds the glue from the window, simplifying this once tedious task. The SteamBlade will allow you to remove window film, vinyl wrap or lettering in a fraction of the time of conventional methods. Do you find it difficult and time-consuming to remove window film, vinyl wrap and lettering? The days of removing window film, vinyl wrap or lettering with a razor blade, ammonia mixture or hoping for a sunny day to heat up the tint for easier removal are a thing of the past. The SteamBlade removes film, vinyl wrap and lettering quickly, easily and safely. *Note: 7.5' Drapery Hose is not for garments which only uses 5.5' Hoses. The longer drapery hose is not as efficient in steam production required for taking wrinkles out of garments. 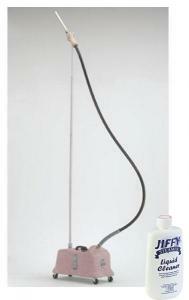 Jiffy Steamer proudly introduces its new Jiffy Steamer "I" KIT Hose Attachment. The "I" KIT Hose Attachment will suit all of your steaming needs by providing you one hose with three, interchangeable steam head options and an add-on brush attachment. 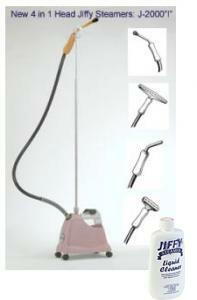 Jiffy Steamer offers this interchangeable head kit for both 5.5 foot and 7.5 foot hose attachments. The “I” KIT Hose Attachment will suit all of your steaming needs by providing you just one hose with four steam head options that are interchangeable. 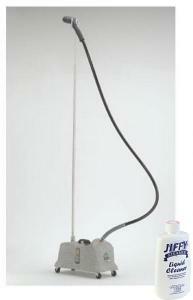 The “I” Kit Hose Attachment consists of a 9” long bent aluminum pipe head attachment for narrower orifice, directional steam blasting, “B” brush 1" diameter steam cleaning head for combination agitation and steam cleaning, 6” wide metal steam head (6 holes) to replace standard head, and a 12” wider carpet steam head (12 holes) for sanitizing upholstery, bedding or unrolling carpeting to lie flat. Now you can invest in one hose and have 4 interchangeable steam heads to tackle the task at hand. The “I” KIT Hose Attachment will suit all of your steaming needs by providing you just one hose with four steam head options that are interchangeable. 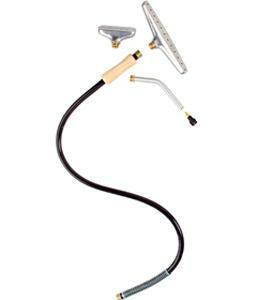 The “I” Kit Hose Attachment consists of a 9” long bent aluminum pipe head attachment for narrower orifice, directional steam blasting, “B” brush 1" diameter steam cleaning bristle head for combination agitation and steam cleaning, 6” wide metal steam head (6 holes) to replace standard head, and a 12” wider carpet steam head (12 holes) to sanitize upholstery, bedding and make unrolling carpet lie flat. Now you can invest in one hose and have 4 interchangeable steam heads to tackle the task at hand. Jiffy Steamer 0893 Vertical Ironing Steam Board 24x48"
Note: This product includes Over-the-Door Bracket and Mounting Screws that screw into the door or the wall. The Jiffy 0893 Steamboard is a variation of the most popular Jiffy 0893 Steamboard which hangs vertically against doors and walls. The Jiffy® Steamer Steamboard comes with our professional garment hanger and eye screw mounted at the top of the steamboard. The sturdy hanger's coated clips hold the garment in place and provides a convenient workplace to steam. The board is covered with moisture-resistant fabric and attaches in 1 of 2 ways: Option A: Hangs over a door with a bracket. Option B: Directly to the wall with screws. Attachment options are included in the steamboard carton. 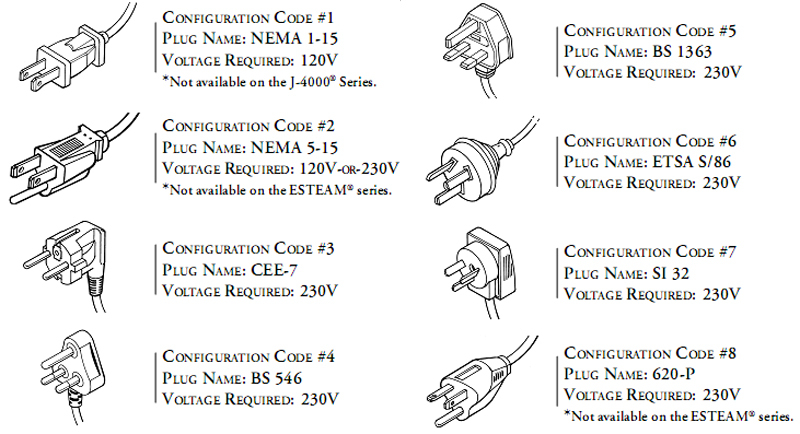 This product is available for UPS or FedEx ground shipping only within the 48 contiguous States. Not for export. The Jiffy Hand Mitt allows you to steam your garments in seconds and stubborn wrinkles are easly removed with hand pressing before and after steaming. Jiffy® Steamer is proud to offer the new Jiffy® Hand Mitt specifically designed to use with our products while steaming. 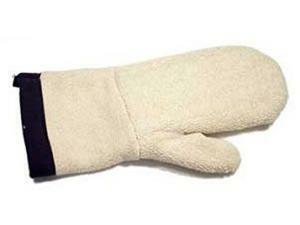 As you know steam is hot, so use this protective mitt when steaming. The extra-heavy mitt, which is made of the 100% cotton terry cloth, has insulating properties to prevent penetration of steam. The Jiffy® Hand Mitt allows you to steam your garments in seconds and stubborn wrinkles are easily removed! *FREE separate Ground shipping within the USA 48 contiguous states only, Jiffy Cleaner is not permitted to ship by air, Any other Jiffy Steamer items under Recommended Accessories that are added to your order will not incur any additional shipping costs, if the total order is $25 or more. We cannot afford to process and ship any order of less than $25, especially with free shipping. Thank you for your understanding. 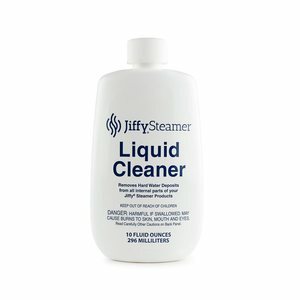 *FREE Bottle of Jiffy Cleaner with selected Jiffy J2, J2000, and J4000 upright steamer purchases under Other Items You May Be Interested in at the bottom of this page. .
Our unique Liquid Cleaner removes hard water deposits from Jiffy ® Steamers. It is easy to use and works on all Jiffy ® Steamer models. It is suggested to use this cleaner as a preventative solution every 3 to 6 months depending on quality of your water and usage of the Jiffy Steamer. One 10 ounce bottle included. Not available for export or air shipments. Jiffy Steamer 0899 Jiffy liquid cleaner, 3-pack. 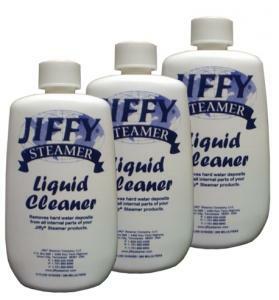 Jiffy's unique Liquid Cleaner removes hard water deposits from Jiffy Steamers. 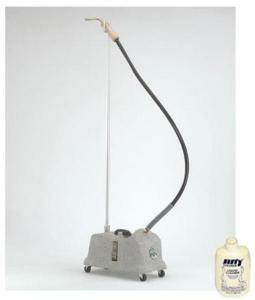 It is easy to use and works on all Jiffy Steamer models. It is suggested to use this cleaner as a preventative solution every 3 to 6 months depending on the quality of your water and frequent usage of the steamer. Three 10 ounce bottles per package. *FREE separate Ground shipping within the USA 48 contiguous states only, Jiffy Cleaner is not permitted to ship by air, Any other Jiffy Steamer items under Recommended Accessories that are added to your order will not incur any additional shipping costs, if the total order is $25 or more. We cannot afford to process and ship any order of less than $25, especially with free shipping. Thank you for your understanding. 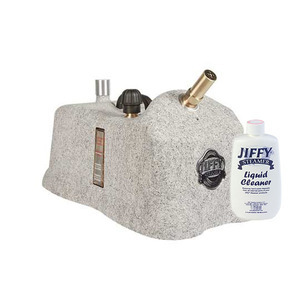 Jiffy Steamer Company's $14.99 online price is plus shipping costs! 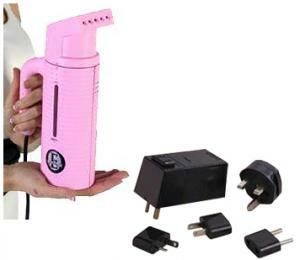 FREE Bottle with all purchases of Jiffy J2, J2000, J4000 Upright Garment Steamer Purchases. 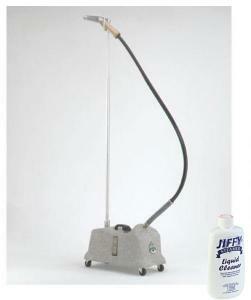 Our unique Liquid Cleaner removes hard water deposits from Jiffy ® Steamers. 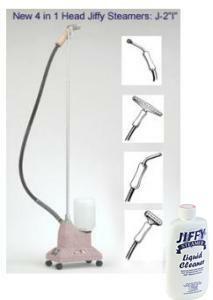 It is easy to use and works on all Jiffy ® Steamer models. It is suggested to use this cleaner as a preventative solution every 3 to 6 months depending on quality of your water and usage of the Jiffy Steamer. Three 10 ounce bottles per package. Not available for export. 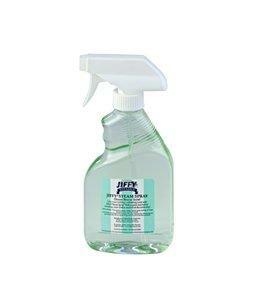 Jiffy Steamer 0899 Jiffy liquid cleaner, 3-pack. 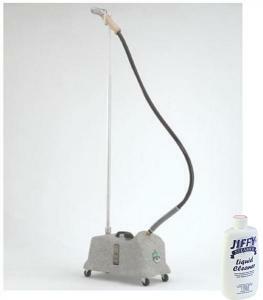 Jiffy's unique Liquid Cleaner removes hard water deposits from Jiffy Steamers. 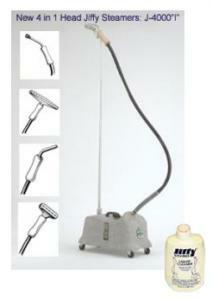 It is easy to use and works on all Jiffy Steamer models. It is suggested to use this cleaner as a preventative solution every 3 to 6 months depending on the quality of your water and frequent usage of the steamer. Three 10 ounce bottles per package. Includes a Jiffy Steamer 3-year Limited Product Warranty. Please note: The cleaner can not be shipped outside the USA (48 states) because it is considered as "Hazardous Material"
Evercare Magik Brush quickly and effectively removes lint, fuzz, dust, dandruff and pet hair from clothing, bedding and upholstery. A comfort-grip handle and double-sided surface ensures longer brush life, twice the pick-up capacity of one-sided brushes, plus convenient left or right hand use. 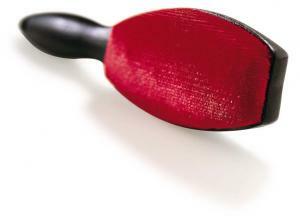 Keep your clothing and upholstery looking their best with this handy brush. Our Professional Grade Lint Roller features a reusable comfort-grip handle and Super Tac2 Professional Strength Adhesive lint strips. The Zip Strip technology enables quick and easy sheet removal with no waste. The roll is 4 inches wide x 30 feet long. 1 handle and 1 roll per order. Great for home, office or travel! Super Tac2 professional-strength adhesive lint strip refills fit our Professional Grade Lint Roller featuring a reusable comfort-grip handle The Zip Strip technology enables quick and easy sheet removal with no waste. The roll is 4" wide x 30 foot long. 3 rolls per order. Great for home, office or travel! Choose Lavender, Ocean Breeze, or Tickled Pink Fragrance. 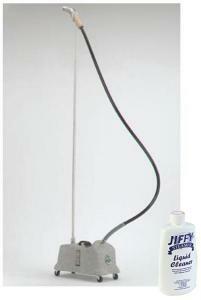 The scented Jiffy Steam Spray leaves your clothes and fabrics smelling fresh and clean! Simply mist your garments or fabrics with our scented spray prior to steaming, then steam as normal to release the fragrant smell of lavender or fresh ocean breeze. The scented Jiffy Steam Spray is made with high quality essential oils for a long-lasting fresh scent. We also offer our new Tickled Pink Spray. These delightful scents will make your clothes feel and smell refresh all day! Please note: This item ships only to the continental USA via ground. Choose Lavender, Ocean Breeze, or Tickled Pink Fragrances. The scented Jiffy Steam Spray leaves your clothes and fabrics smelling fresh and clean! Simply mist your garments or fabrics with our scented spray prior to steaming, then steam as normal to release the fragrant smell of lavender or fresh ocean breeze. The scented Jiffy Steam Spray is made with high quality essential oils for a long-lasting fresh scent. 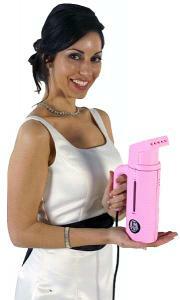 We also offer our new Tickled Pink Spray. These delightful scents will make your clothes feel and smell refresh all day! Jiffy Metal Drapery Steam Head Accessory *Wood handle not included. Fits removable wood handle with hose only. 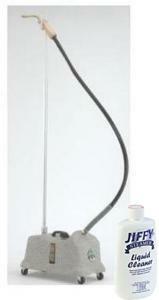 20" Angled Pipe Head, 1500W, USA, 1Gallon, 2 Hour Operation, Free Tank Cleaner with Purchase. Steam Breaker literally takes the legwork out of breaking in new footwear! Breaking in leather boots can be a pain – literally. Stiff, uncomfortable leather can chafe and blister your feet and take all the fun out of getting a new pair of kicks. Using Jiffy Steamer’s "Steam Fit" technology, the SteamBreaker quickly relaxes leather footwear to conform to the shape of your foot. Your customers will experience the comfort of a custom fit in a matter of hours, not weeks. 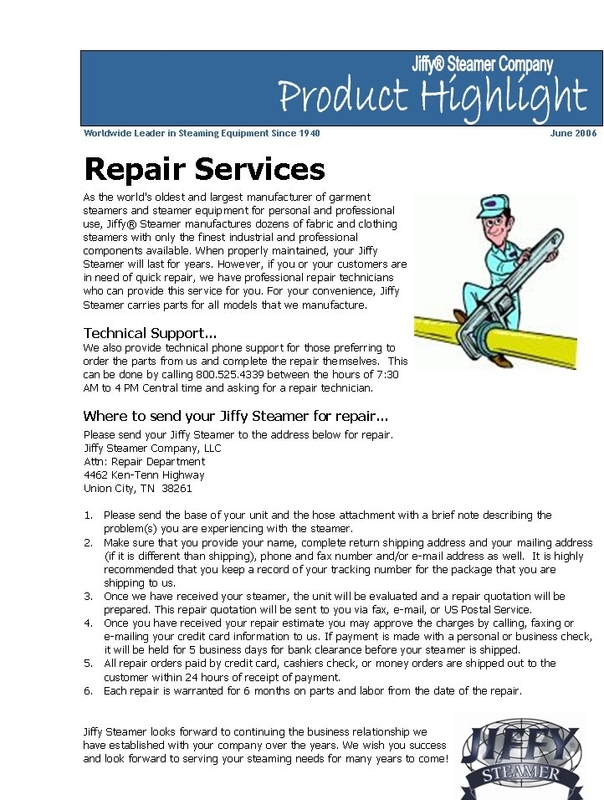 Make Jiffy SteamBreaker a part of your business today. Your customers – and their feet – will thank you! 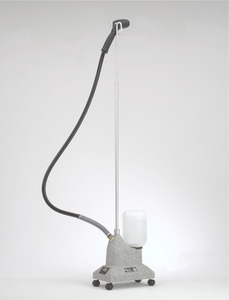 Complete with a larger, self-contained one gallon water reservoir, both pre-heat (standby mode) and steam thermostat controls, a 20" curved aluminum pipe and 1,500 watts of steaming power, the heavy-duty J-4000SBR model’s warm, moist steam relaxes the leather allowing it to mold to the shape of the foot. Equipped with a sight gauge on the side of the steamer, you can easily view water level and sediment build-up at a glance. MADE IN THE USA. Outfitted with a three-quarter gallon water caddy, a quick 1.5 minute heat-up time and 20" curved pipe aluminum pipe, this model is perfect for the smaller shop. The warm, moist steam relaxes the leather allowing it to mold to the shape of the foot. The standard Model J-2000SBR SteamBreaker is equipped with 1,300 watts of steaming power. MADE IN THE USA. 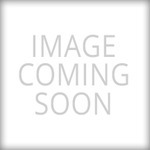 SewingMachineStore and SewingMachineStore.com are property and trademarks of AllBrands, LLC, dba AllBrands.com. All Rights Reserved.